In today's unsettled world, Centerville firm tries to offer global clients some peace of mind. Leah Hogsten | The Salt Lake Tribune The vehicles have 2-inch thick glass panes hidden from view that appear unaltered, Friday, April 13 2012 in Centerville. 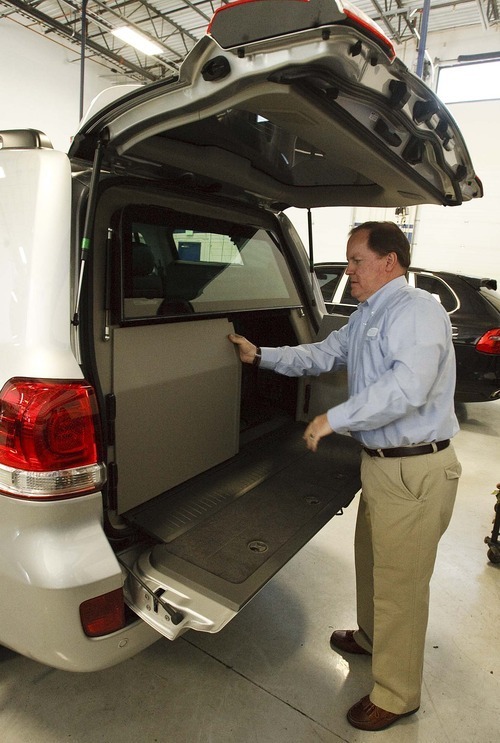 Once a certified public accountant, International Armoring Corporation CEO and President Mark F. Burton, branched out into armoring cars in 1993. His Utah business based in Centerville, with installation facilities in S. Africa, the Philipines, UK, and Hong Kong, makes vehicles for heads of state in foreign countries, celebrities and some of the wealthiest people in the world. Leah Hogsten | The Salt Lake Tribune International Armoring Corporation CEO and President Mark F. Burton Armor holds plating, left and synthetic materials that are used in their armored vehicles. Leah Hogsten | The Salt Lake Tribune International Armoring Corporation's technicians Francisco Agredano and Carlos Estrada prepare a vehicle for armoring. The Centerville-based business makes vehicles for heads of state in foreign countries, celebrities and some of the wealthiest people in the world. Twenty percent to 30 percent of IAC's business is military. Leah Hogsten | The Salt Lake Tribune Mark Burton shows off a modified vehicle that costs $65,000 to $85,000. Enhanced with two inch thick windows and reinforced walls, the vehicle is able to withstand attacks, but maintains the appearance of an unaltered vehicle, as shown above with a hidden fortified interior hatch. 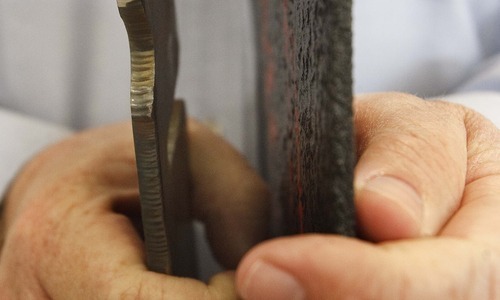 Once a certified public accountant, International Armoring Corporation CEO and President Mark F. Burton, branched out into armoring cars in 1993. His Utah business based in Centerville, with installation facilities in S. Africa, the Philipines, UK, and Hong Kong, makes vehicles for heads of state in foreign countries, celebrities and some of the wealthiest people in the world. Friday, April 13 2012 in Centerville. 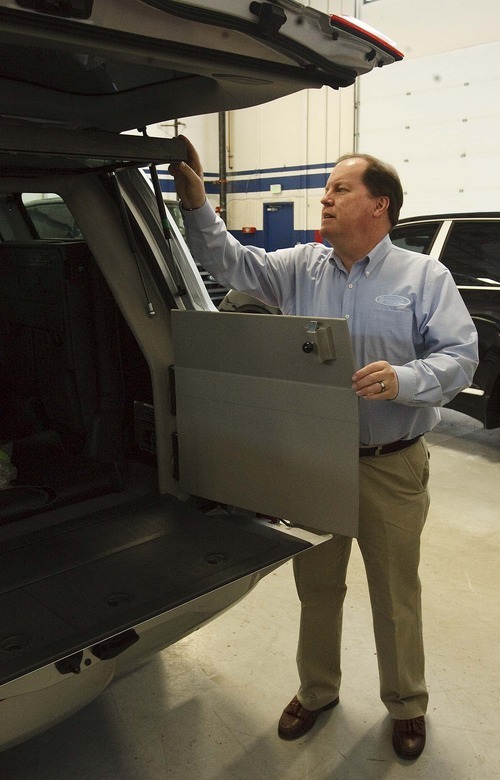 Leah Hogsten | The Salt Lake Tribune Mark Burton shows off a modified vehicle that costs $65,000 to $85,000, enhanced with two inch thick windows and reinforced walls making them able to withstand attacks, but maintaining the appearance of an unaltered vehicle. 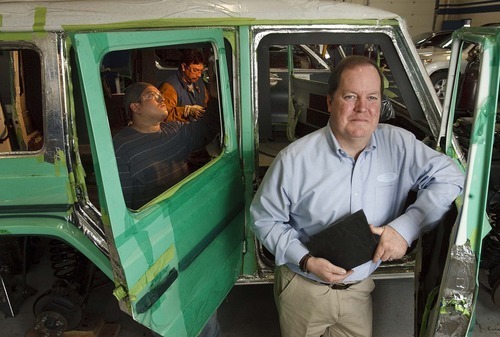 Once a certified public accountant, International Armoring Corporation CEO and President Mark F. Burton, branched out into armoring cars in 1993. His Utah business based in Centerville, with installation facilities in S. Africa, the Philipines, UK, and Hong Kong, makes vehicles for heads of state in foreign countries, celebrities and some of the wealthiest people in the world. Friday, April 13 2012 in Centerville. Leah Hogsten | The Salt Lake Tribune Once a certified public accountant, International Armoring Corporation CEO and President Mark F. Burton, (right) branched out into armoring cars in 1993. His Utah business based in Centerville, with installation facilities in S. Africa, the Philipines, UK, and Hong Kong, makes vehicles for heads of state in foreign countries, celebrities and some of the wealthiest people in the world. Friday, April 13 2012 in Centerville. Mark Burton's customers are either insanely rich, very well-known or hold top positions of power somewhere on the globe. And they are huge fans of his products, because they can mean the difference between a violent death or making it home at night. 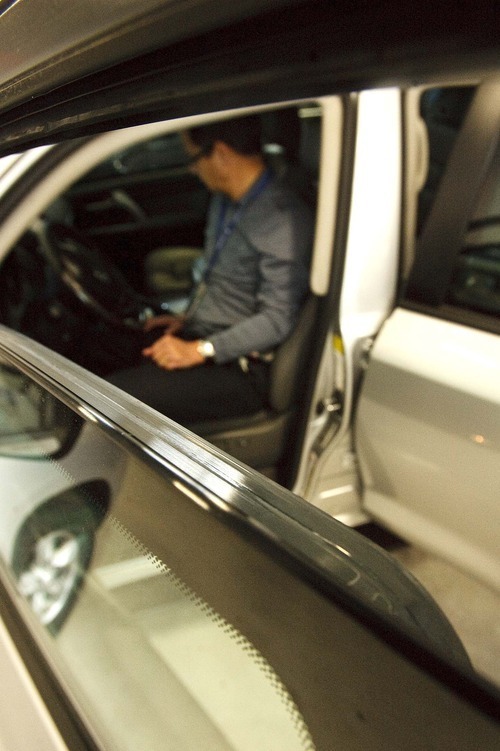 His company, International Armoring Corp., (IAC) makes bulletproof cars that, from the outside, look no different from the family sedan or a SUV. Outfitting an auto runs $65,000 to $85,000, on top of the vehicle's cost. The promised "Shelter from the Storm" comes at a price. "Because of the confidential nature of what we do, we don't disclose (client) names," Burton said, noting that earlier this year a foreign head of state survived a hundred-bullet barrage, thanks to one of IAC's vehicles. "He called and said he loved me," Burton said. One of IAC's slogans, "Who says you can't buy peace of mind" sometimes hits home in a sobering way. Last week, the company was featured on the Discovery Channel's "Sons of Guns" show, where producers asked IAC to take an armored B6 Porsche Cayenne to the next level by outfitting the interior with offensive firepower. That was for entertainment purposes because IAC's products are typically only defensive in nature. In 1993, Burton  an accountant by profession  launched the business in Ogden with the goal of armoring and selling two dozen vehicles that year. "We ended up doing over 225," he said. "The bulk of our products are purchased outside the U.S.," Burton said, noting that Mexico is a high-demand market, along with countries in Africa, eastern Europe, southeast Asia and the Middle East. According to a March 2012 analysis from the Netherlands-based ASDReports, the armored-vehicle market is an $11 billion industry, much of it focused on military production. IAC's primary focus is slightly different  in the early 1990s it produced one of the first "Pope-mobiles," Burton said. Twenty percent to 30 percent of IAC's business is military, said Mark Burton Jr. The market for IAC's personalized products thrives in countries where leaving the house can be a dangerous action. Some intersections in Caracas, Venezuela, have signs posted that warn of frequent car-jackings, Burton said, and "quickie" kidnappings in Mexico City occur often, to drain the victim's bank account at the closest ATM. "During the Iraq conflict, we had to rent two other Utah facilities to keep up with the demand," Burton said. In 1996, the small business ramped up international production and at one point had 14 facilities in operation. However, Burton said they have since been consolidated because of management and control concerns. During the company's 20 years in business, there have been almost 300 attacks on the 8,000 vehicles it has sold. Their clients include 40 different heads of state around the world. "We've never lost a client," said Mark Burton Jr., while noting that some have had heart attacks and strokes amid the trauma of an attack. "First we strip the vehicles apart," Burton said. "The goal is to retain the original performance of these vehicles," Burton said of the Hummers, Jeep Cherokees, Range Rovers, F-150 trucks and smaller sedans that bulk up at IAC's installation sites. "These are not tanks," Burton said. "We're giving (our clients) the time to recognize they're being attacked and then to be able to escape a dangerous situation."